Seriously addicted to Facebook? The HTC Status ($50 with a two-year contract from AT&T), which debuted at Mobile World Congress as the ChaCha, keeps you connected with your family and friends on the world's most popular social network. Targeted toward younger audiences, the Status doesn't have the most cutting-edge specs, but the integration with Facebook within the software and the hardware sets it apart from other messaging phones. While the Status might be inexpensive, its design and construction are far from cheap. The slightly curved design feels nice in the hand, and its build seems sturdy and high-end. The AT&T unit we received for review is white with silver accents, which looks quite stylish and sets the phone apart from the legions of black and chrome handsets out there. You can also buy a special mauve edition of the phone from Best Buy Mobile. RIM might be having difficulty keeping its BlackBerry brand afloat, but the legacy of the BlackBerry design lives on. The Status also sort of resembles the HTC Dash, the Windows Mobile 6.5 phone from about two years ago. 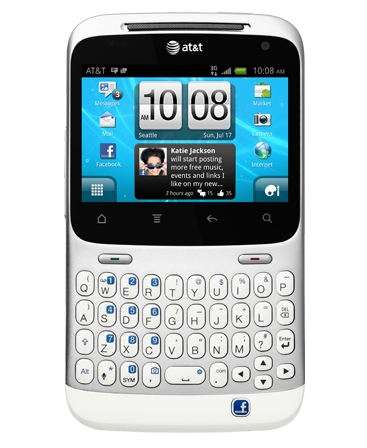 The face of the Status is split between a touchscreen and a physical QWERTY keyboard. And as with BlackBerrys, this keyboard is excellent and makes for comfortable, one-handed typing. The keys are sufficiently large and nicely spaced, and they have a satisfying amount of tactility. You get some useful shortcut keys, as well, such as a camera key, a ".com" key, four-way directional arrow keys, and a voice-command key. The 2.6-inch display feels pretty cramped, however, and the low, 480-by-320-pixel resolution won't do your friends' profile photos any favors. The screen is too small for videos (aside from the quick YouTube clip), and the limited surface makes gaming difficult. It is fine for dashing off email, doing some light browsing, and skimming your Facebook feed. Between the keyboard and the display, you'll find two oblong physical keys. The green key to the left takes you to your contacts and call history when you press it at the home screen. The red key is the End key when you are on a call, but it has other uses as well: When you are at your home screen, you can press this key to see thumbnail versions of your walls. Above those two keys, you'll find the familiar Android touch keys--Home, Menu, Back, and Search--built into the display. Below the keyboard is a button with Facebook's familiar "F" logo. This is the Share button, and it gives you quick access to the most important Facebook features. You can update your status or post on a friend's wall by pressing the button from the home screen. To check in to Facebook Places, you press and hold the Share button. At the top of the phone, you'll find the power button and the 3.5mm headphone jack. The HTC Status runs Android 2.3 with the latest version of the HTC Sense interface (Sense 2.3.3), as well as some unique Facebook features. In this version of Sense, you get the spruced-up lock screen, where you can pin shortcuts to your most frequently used, go-to apps. Unfortunately, you don't get cool, 3D-like spinning walls (see our HTC Sensation review), but you can pinch anywhere on the home screen to see thumbnails of your walls (as on all of the most recent HTC phones). Syncing your Facebook account to the Status is simple: When you first turn on the phone, you'll see a box that asks if you want to connect to Facebook. Tap this box, and you go to the Facebook login page. You then type in your Facebook information, and--bam!--you're ready to take on the Facebook world with your HTC Status. The Status will ask for permission to access both your Facebook wall (which you need to grant if you want to be able to post status updates) and your contacts (so your friends' Facebook information appears in contact profiles). You'll also have the option to link your Flickr account and your Twitter account, if you want. Updates from the various social networks will show up in your Friend Feed, a widget we've seen on other HTC Sense phones. The Friend Feed aggregates status updates, tweets, and the like into a single stream so that you can see what's going on with your pals across networks. The main page also shows a shrunken version of the Friend Feed that displays updates only from Facebook. Something I didn't realize was that as soon as you log in to Facebook, you're automatically shown as being "online" and signed in to Facebook chat. In fact, one of the special Facebook widgets is a Chat widget, which lets you see who is online and allows you to start conversations with them directly from the home screen. This is a neat feature, but I don't always want to show up as "online" when I sign in to Facebook. Somebody actually started chatting to me, but I was completely unaware and didn't reply (I had the phone on silent) until I looked at this feature more closely at a later time. How rude of me! Thankfully, it is quite easy to go "offline" by pressing the green circle at the top of the chat widget. Lastly, as you might have guessed, you won't find tight integration with Google+ on the Status. If you want to stay connected on Google's new social network, I recommend downloading the excellent Google+ Android app. The Status has a back-facing 5-megapixel camera with an LED flash. Image quality is okay. My indoor photos had a bit of a dark cast to them without the flash, but then they looked blown out with the flash. Outdoor photos seemed better, with brighter, more natural-looking colors. Like other Android phones, the Status makes it incredibly easy to post photos to Facebook from the Gallery. You have the option to share either via Facebook or through Facebook for HTC Sense. The difference between those two options is that Sense lets you have a little more control over who sees the photos you post, as well as which album a picture ends up in (otherwise it will just default to your Mobile Uploads album). You can also share photos with friends by way of Flickr, Gmail, MMS, Picasa, Twitter, and various other social networks and platforms. The phone runs on AT&T's 3G network, not the carrier's "4G" HSPA+ network. If you're looking for a keyboard phone on AT&T's 4G network, your only option is the HP Veer 4G, with its tiny slide-out keyboard. Network performance was decent. I frequently got two or three bars of reception, as I normally encounter with AT&T phones in San Francisco. Call quality was just okay. On all of the calls I made, I could hear a faint hissing sound in the background. A few of my friends could hear it as well. My friends' voices sounded pretty distant on the other end of the line, while one reported that my voice sounded "scratchy, a little staticky, but tolerable." Thankfully, none of my calls dropped. While the HTC Status might not have the most cutting-edge specs, it gets the job done, letting you easily stay connected to all of your social networks. The hardware integration, in the form of the Share button, is especially useful; the special Facebook widgets are unique, as well. You also get an attractive messaging phone with the latest version of Android for an unbeatable price, which makes the Status appealing to many different types of users. With the advent of Google+, however, Facebook might not be as popular two years from now. What if everybody jumps the Facebook ship for Google+? (Could you imagine having a MySpace phone now?) Don't laugh--it could happen! While the Status might not have the most advanced specs, the software and hardware integration with Facebook is very cool.